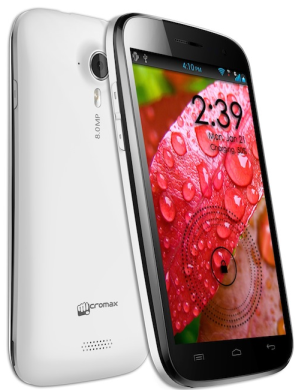 Micromax announced the beginning of online sales of their new smart phone Micromax A116 Canvas HD. That is much-awaited phone by mobile users because the successful reach of Micromax A110 Canvas 2. Micromax Canvas HD runs on Android 4.1 Jelly Bean operating system and equipped with 1.2 GHz quad core MediaTek MT6589 processor. This is the first Micromax phone powered by quad core processor. This Dual Sim phone comes with amazing graphics and HD viewing experience that has 5 inch display with an HD IPS display with the resolution of1280x720 pixels. Micromax Canvas A116 has 1 GB RAM and 4 GB of internal memory and external memory can be upgraded up to 32 GB through microSD card. It sports with 8 Mega Pixel Rear camera with LED Flash support and also having VGA front camera for video calling. The users can browse the web, download and watch videos faster with 3G connectivity. Also users can download HD quality videos and watch on their phone without losing the quality. This phone has great performance and quality and cheap in price that surely compete the other company smart phones. Micromax Canvas HD A116 priced for Rs. 13900 and now available only at the official Micromax website. The wait is over, now you can book for one. The phone will be delivered to you in 5-7 working days.